The original "Rock" was the concrete stands and the athletic dormitory located on the East side of what was then Faulkner Field. Construction began in December of 1938 and was completed in early 1939. 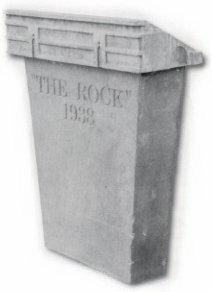 The members of the 1939 football team were in part responsible for the construction of the structure and spent many of their off hours hauling concrete in "Georgia buggies" in, around and up into what would become "The Rock." Hours and hours of blood, sweat and tears of the players went into the construction of the place that would become their home on and off the field. As they worked to build "The Rock" they were paid about 18 cents an hour. Although no one can quite recall who gets credit for naming it "The Rock," it is easy to see why it got it's name. 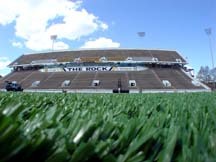 From its rock-like frame in the early days of being erected by the players hauling rocks, to the fact that the football team inhabitied it, stood like a rock when opponents entered it for battle, "The Rock" is perfectly named. There also seems to be some that compared its construction to working on the chain gang at Alcatraz, known as the "The Rock." The original wooden stands that stood on the West side of Faulkner Field aslo have a place in the history of "The Rock." Those stands were built in 1932 during the depression by unemployed workers of Hattiesburg, who like the players several years later, gave their blood, sweat and tears to create Faulkner Field, named after L.E. Faulkner, the man who built it. The west side concrete stands would be added to Faulkner Field in the early 1950's and be fondly called "The New Rock" and Southern Miss players would continue to live in the "Old Rock" until the Vann Hall athletic dormitory was erected in the late 1960's. Faulkner Field would get a facelift during a three year period from 1973-76 and the stadium was modernized and the seating capacity expanded to 33,000 seats. The new stadium would be called M. M. Roberts Stadium, after college board member and Hattiesburg attorney, M. M. Roberts. one of the university's top financial contributors, Memphis businessman and 1964 graduate Gene Carlisle. Money donated by Carlisle was used to install Momentum Turf by Sportexe in place of the grass field at M.M. Roberts Stadium. Rising from the rolling hills of Southern Mississippi like a fortress, it beckons you to enter and dares you to conquer it. Here autumn afternoons entertwine with fierce gridiron action where legends, such as Brett Favre and Ray Guy have taken the field.